NEW version 2 featuring alternative serif capitals, word art and tweaked metrics. 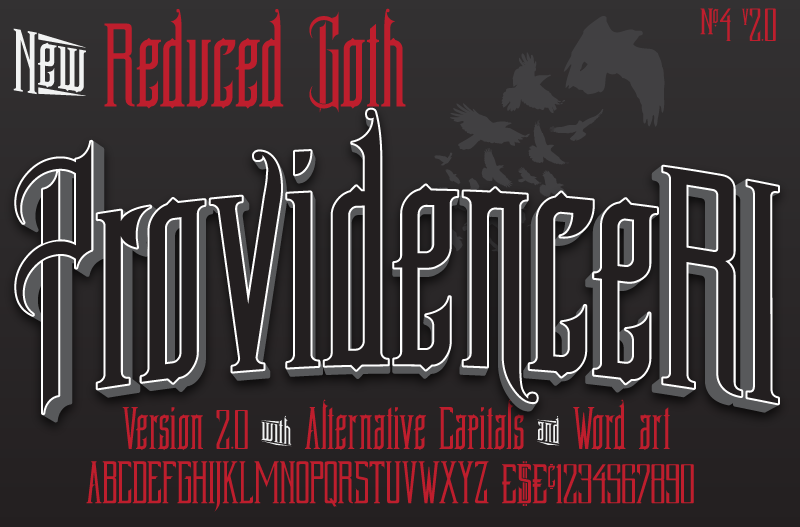 ProvidenceRI was spawned from the typography of a 1900 Sanborn Perris Map Co. Ltd. map cover for Providence, Rhode Island, USA and in part from Goth watching in Whitby, North Yorkshire, UK, during Goth Weekend, 2014 (It’s a thing. Google it!). The result is ProvidenceRI. Less Goth than the Sisters of Mercy, more Goth than Michael Bublé. Providence RI has limited language support (so you can type Bublé properly! ), with a view to extending this at a later date and is served as is and 100% free. If you like the font, please feel free to show your appreciation by using the ‘Buy the author a Beer with Paypal button’ mislabelled ‘Donate to the Author’ and situated right below the download button on the right of this page. Should you have the good fortune to find a commercial use for ProvidenceRI, you can similarly earn good karma and share some of the love using the same method. However you use it, I’d love to see some examples of my goth/vintage child set free and in the wild. Links via the Dafont PM system would be greatly appreciated. Comments, suggestions & requests are most welcome. Thanks must be extended to the naughty mods and staff of Dafont for their patience, help, expertise and encouragement, without which this endeavour wouldn’t have been possible.